TRINAKRIA has been launched in 1927 in Austria at the Wienerwerft in Vienna. 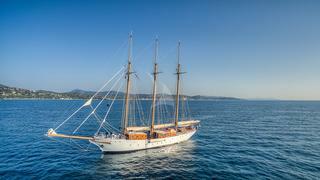 Designed by the yard as a training sailing vessel for the Bulgarian state fisheries school in Varna on the Black sea, she was rigged as a two mast topsail schooner and fitted with a 200hp Deutz engine giving her a maximum speed of 9 knots. 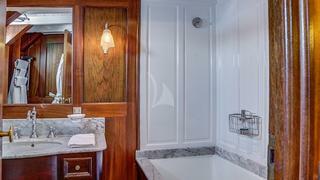 But her times as a training fishing schooner were very short as she was sold in 1931 to German owners from Hamburg and converted to a luxurious sailing yacht at the Schlichting werft in Travemünde. Renamed CAROLA, she was at that time in 1932 the biggest private yacht in Germany and was featured in the famous DIE YACHT magazine. 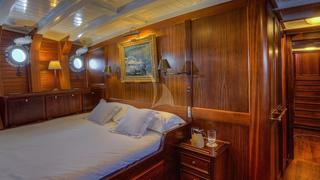 CAROLA sailed on private cruises on the Elbe and the north sea. Sold in 1938 to a french yachtmen member of the Yacht Club de France, she started in july 1939 a scientific cruise unfortunately stopped by the outbreak of WWII on September 1939. Perhaps to save her from possible seizing in these war times, CAROLA was sent to French morocco in Casablanca where she stayed during all the war and the following years, with very few sailing. Her French owner decided to sell her in 1951 and called his friend Marin Marie, a famous marine painter and yachtsmen to sail her to Monaco to her new owner. 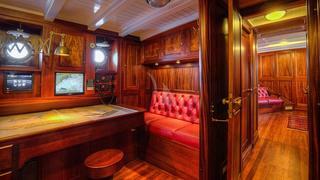 Little is know of the boat’s life between 1951 and the 70’s as she was under Italian ownership. 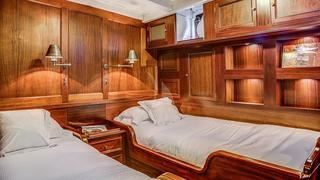 Sold in 1970 to a Cannes based yacht captain, she started a new life as charter yacht under the name ZAMOURA, hired for films and for cruises nearby Cannes where she was berthed alongside with SHENANDOAH, another famous schooner still afloat today. 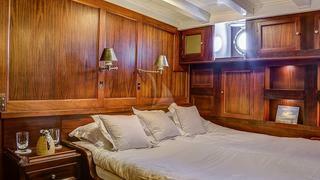 In these days, a mizzen mast was added, changing her to three mast topsail schooner rigging.Sold in mid-70’s to a Swiss hotel tenant of Zermatt, she was renamed to ZAMOURA of ZERMATT and used as a private yacht based in Cannes and then in Saint Mandrier. 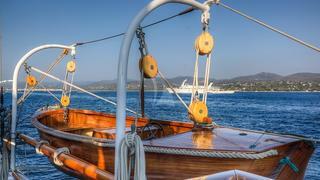 During twenty years, she sailed for coastal cruises on south of France and Italy. Due to it’s age and lack of caretaking, the state of the boat was very bad in 2002 when the actual owner bought her in Monaco. 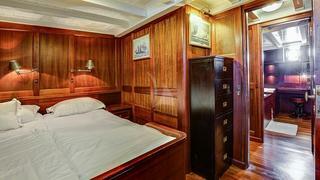 A major refit was needed urgently to bring her to life and to classic yacht standard with modern comfort. The steel hull was in need of major overhaul with major steelwork to be done along with the rebuilding of all systems and fitting of new main engine. The boat was towed to Agadir in Morocco where refit started in 2004 at Chantier Naval HESARO. Major technical difficulties combined with the failure of the local shipyard lead to a long and ambitious eight years refit. But in March 2012, she was afloat again, sailing to La Rochelle where two years more were needed to complete masting and rigging and all works needed to achieve her rebuilding as charter yacht with all aspects of a classic yacht. In August 2014, TRINAKRIA was ready for sea and first sea trials under sails. 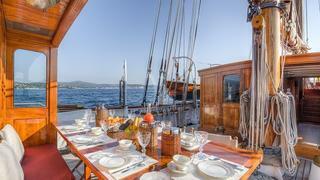 TRINAKRIA has then sailed to Morocco, Spain, Sicilia, Malta, South Italy, the Adriatic sea and south of France where TRINAKRIA was seen on classic yacht events in Cannes and Saint Tropez.